"I agree with May. Consider the poet Charles Olson's Projectivist idea of the page being the field, the container of the flow of energy from the subject to the author, and then to the reader ... it is in reality, and not just symbolically,…"
D. L. Major replied to Lia Keyes's discussion FAVORITE STEAMPUNK BOOKS? "I'm reading Dreadnought, by Cherie Priest. After the disappointment of Boneshaker, I was reluctant to commit to another of her books, but so far, it's very good. Actually, it feels like it's by a different author. It has none of the…"
D. L. Major replied to Lia Keyes's discussion DEFINING ELEMENTS OF A STEAMPUNK NOVEL? "Not the only defining characteristic, but here's one that gives a steampunk novel some extra heft in my eyes... There needs to be some consideration of a dislocation or tension between humans and their environment, and this dislocation must be…"
D. L. Major replied to Lia Keyes's discussion HOW LONG CAN STEAMPUNK LAST? "I think it will last. Better than that, it will grow, in depth as well as in general popularity. 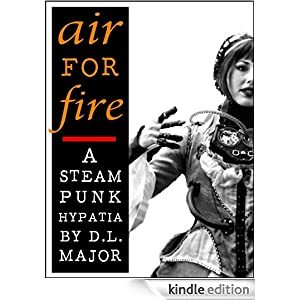 This will happen because unlike many fashions and memes, steampunk is a combination of a visual aesthetic and a constructive philosophical framework.…"
D. L. Major replied to Lia Keyes's discussion HISTORICAL ACCURACY IN STEAMPUNK? "The Thames is a river in the former territory of Russia, and has been known as such since the area around the city of Wellington, on the coast of the Eastern Baltic, was settled by refugees fleeing the Apache-led invasion of England. Unusually, the…"
"I posted my impressions of Soulless on the Empire site, and I'll copy it here: I loved Soulless. And the thing that made it work, and gave it its delicious centre -- you know, the thing that makes you not want to stop eating -- was the…"
""Beyond that I'm fascinated by all things Steampunk, like someone who's just been diagnosed with a mental disorder and discovers all her oddities are finally understood, if not entirely justified." -- I can so relate to that!…"
Born 1957, in Wanganui, New Zealand. After graduating with a B.A. in Regional Planning from Massey University in Palmerston North. Spent several years touring New Zealand in bands. Emigrated to Australia in 1990, and in 1994 received a B.A. in Fine Art (Painting) from Prahran College in Melbourne. More recently, gained a Diploma in Professional Writing from BRIT in Bendigo, Victoria. Is the author of "The Day of the Nefilim", an SF novel, and "The Secret Weapon", a collection of short stories and poetry created during 2011. Has three daughters; Isobel, Sian, and Carys.